National Volunteer Week was created in 1974 to inspire more people to give back to their communities and find creative ways to get involved. Over the years, the movement has grown into a national celebration of community service and the volunteers who strive to improve the lives of others. If you’re looking for ways to get involved this week, try one of these five great ways to make difference. A great way to get your kids excited about volunteering is to help animals. If you don’t have pets at home, taking the family to volunteer at a pet store or animal shelter is a fun way for kids to spend time around animals. Whether the kids play with the cats and dogs for company or spend time cleaning up, it can show them the importance of giving back. Are you a painter, writer, musician or athlete? Local nonprofits that host youth programs can always use talented volunteers to lead classes and workshops. If you have spare time this week, consider checking in with a local youth center to see what their current needs are. Teens looking for ways to make a difference might want to consider sharing their computer skills. Most kids who are born into a world full of smart phones take their computer knowledge for granted. It’s difficult for older people to keep up with all the changes in technology. Encourage your teens to offer computer help to their grandparents or elderly neighbors this week. If you already volunteer regularly, you can make a difference by sharing the causes you’re passionate about with others. This week is a great time to get others as excited about volunteering as you are. Many people want to volunteer more, but don’t know where to start. Seeing tips from a seasoned volunteer may be all they need to get motivated. If you have a specific cause that needs more volunteers, consider sharing a story or link to the campaign on social media. It can also be helpful to share resources such as Volunteer Match or other tools that connect volunteers to causes. 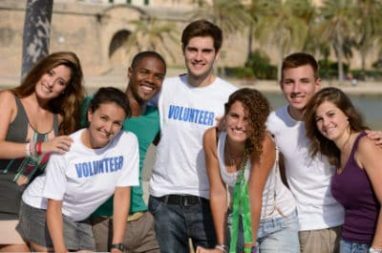 You can even promote National Volunteer Week itself with #NVW2016. Help an older friend or relative clean out their garage this week. You can even go one step further and help them donate an unwanted car taking up space. Car donation is an easy way to get rid of nearly any vehicle, but it’s also the perfect way to give back to local children’s charities. What better way is there to end National Volunteer Week than by giving back to kids in your community? If you have a car you’d like to donate, please give Wheels For Wishes a call at 1-877-431-9474 or use our online car donation form. Donating your car only takes a minute. Plus, we take care of everything for you from towing to paperwork. You even receive a tax deduction for your donation. End National Volunteer Week on a great note by donating your vehicle!